A duo comprising of voice and horn is a rare occurrence in jazz. Keeping up the pulse, having enough rhythmic movement, and creating a harmony is a tall order for two monophonic lines. 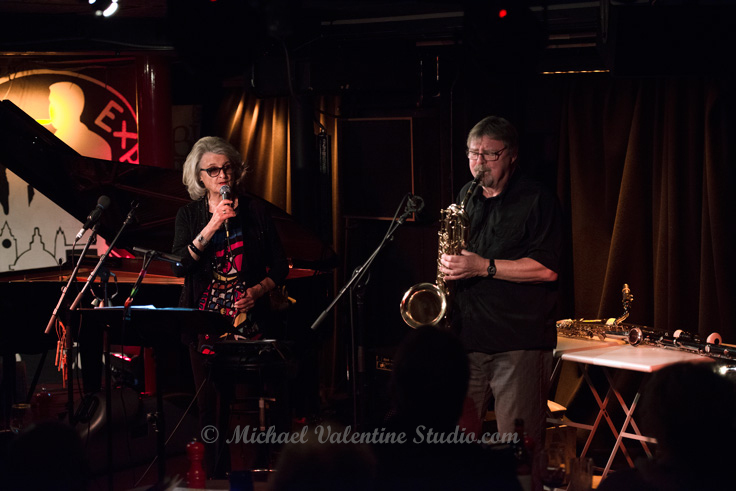 Yet long-time collaborators Karin Krog and John Surman managed it well at Soho’s Pizza Express. Surman, who rarely plays in the UK and lives in Norway, played a variety of saxophones, a bass clarinet, an extraordinarily large recorder, and also accompanied expertly on piano. The Norwegian Krog also had extensive instrumentation: a synth, electronic effects, sound samples, and small percussive instruments. Together they performed a widely eclectic double-set of tunes, ranging from American Songbook standards to traditional Scandinavian folk songs, all interpreted with a unique textural twist. Their dynamic was relaxed and comfortable. The pair have been performing and releasing albums together since the late seventies, and this aided their sensitivity and complete synchronicity with each other. As Krog sang bare, soulful lines in her deep voice, Surman switched between playing long, low notes, and flurries of arpeggios and ascending melodic patterns. There were times when he launched into solo improvisation, often on a blues chord progression, which drew whistles from the audience. There were also moments of humour, such as when Krog riffed on the word ‘potato’ for five minutes in a Norwegian folk song, with Sermon providing fast-moving, nonsensical runs on saxophone. Contrast was further found in their decision to sing a slow, emotive song about sailors who have died at sea, with Sermon noting on their shared background of having grown up by the coast. With the variety of voices and possible soundscapes at hand, the performance was never boring as the pair jumped between instrumentation and song-styles after each piece. Each tune was often prefaced by a brief but pertinent introduction by either Krog or Surman, which lent a context and further interest to the music. In some cases, the sparsity of the sound palette gave a heightened intensity to the performance. Tunes like In a Sentimental Mood and God Bless the Child were moving, with Krog’s voice ringing out true and driving the words home. Their performance of an Indian classical music-influenced song, complete with sound sampled drones and Surman on recorder, was memorable and definitely different. Krog’s experimentation with distorting her voice was also impressive; at one point she used two microphones at the same time, giving an otherworldy, futuristic effect. The event was indeed a rare one, with Surman rarely venturing to the UK, and their collaborative history resulted in a rather cohesive yet exciting performance which will stay in the memory for quite some time.